Summer is motorcycle season. Riders all over the country are getting their bikes out of storage and ready to ride. What better way to welcome motorcycle season back than with a long ride? Sounds like a great idea to us! A short vacation or day trip on a motorcycle is a great way enjoy the beautiful summer weather as well as your bike. However, a long trip on a bike is much different than one inside a car. Before you head out on any extended travel on your motorcycle, make sure your bike (and you) are ready for a long journey ahead. Use this 6-item checklist to make sure your trip will go off without a hitch. When it comes to motorcycle riding, safety always comes first. In an accident, wearing the right gear can be the difference between a couple scrapes and bruises and death. It’s worth noting too, wearing the proper protection isn’t just a long-distance journey measure – this is a requirement for all motorcycle travel! Before you even fire up your bike make sure you are dressed the part. That means wearing a helmet, eye protection, gloves, long pants, a jacket and boots and making sure anyone tagging along is doing the same. You never know when you’ll find yourself in a bind out on the open road. In a pinch, it pays to be a little extra prepared. That’s why having a bag or kit prepared with some helpful items and tools is always a good idea before you head out. Gather a few helpful items like a wrench, socket, flashlight, tape and possibly even an air pump. These items can easily help you out of a jam if something happens along the way by fixing a problem right then and there. It can get pretty darn hot on the open road! 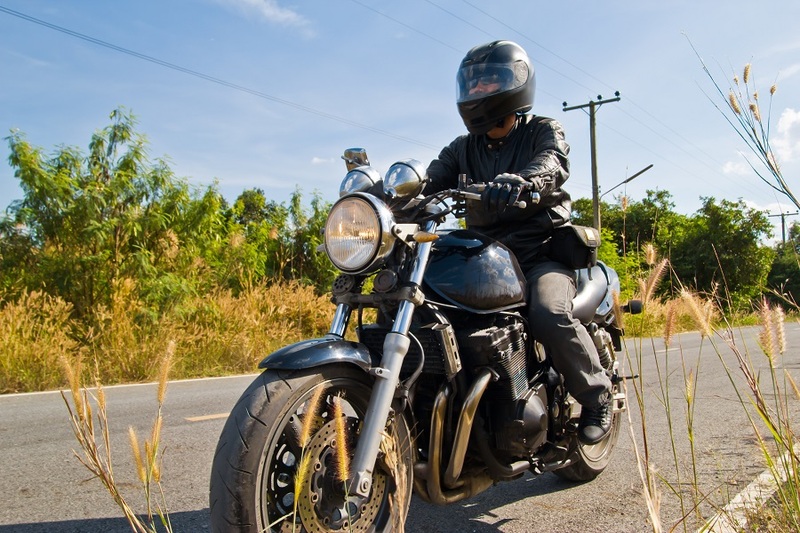 Motorcycles don’t have the luxury of air conditioning and although a rider can be alleviated as a result of the open air, it is important that you stay cool while driving. Don’t head out on any long ride without some water to help keep you cool and hydrated. Getting dehydrated can cause headaches and diminish driving capabilities. Pack a large bottle or jug and fill it up along the way whenever possible. Before you head out, make sure the main things that are going to keep you rolling are in good shape: your tires. A quick check of your tires’ air pressure and wear should be mandatory for any planned travel on your motorcycle. To check motorcycle tire wear, you can use the same penny test you use to check regular car tires as well as checking on the condition of the wear bars. A quick check on tire pressure can be a quick fix to get them to manufacturer-recommended levels. If your tires are in bad shape, get them taken care of immediately or postpone your trip until they are changed. Minor cuts, scrapes and bruises can be commonplace when riding. You can never be too careful, so it is always safe to pack a small first aid kit. This ensures you have bandages, wraps, aspirin, ointment and whatever else you may need to deal with a minor injury along the way. The tires aren’t the only thing you need to check on your bike before you head out on your trip. Your motorcycle needs to be in tip-top shape for the road ahead, so always make the time for a thorough inspection. Brakes, oil, air filters, nuts and bolts, spark plugs and chain wear are all essential checks to make. Some of these are easy items to address yourself. However, if you notice any larger issues make sure you take your motorcycle in to be looked at as soon as you can.